House of Leaves by Mark Danielewiski uses abstract layouts and abrupt changes in voice to alter how the reader engages in the novel and gathers information. When reading House of Leaves the strange layout and copious amounts of footnotes force readers to struggle to gain pieces of key information. By making it easier to skip sections of vital information with such an unsure and obstructed method of reading within the text. For example, the abrupt stopping midsentence within Johnny and Zampanó’s text makes it hard to read each story chronologically. This brings up the argument, does the method in which you read really matter, and if so how do you gain key information? 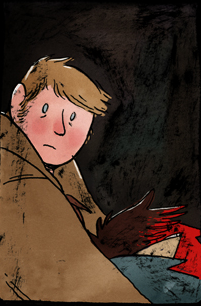 In Emily Carroll’s Margot’s Room, the chronological order in which you read the webcomic doesn’t matter; however, there is an overarching order based on clues. These clues can be detected in change in mood, color, and layout on the screen. These changes allow readers to understand the chronology. We can try and string together the events of Johnny’s and Zampanó’s text based on these clues. Without said clues, readers would have no clue how to put together the chronology of the book when basing their reading method solely on Danielewiski laid out. The footnotes in the House of Leaves, while not as important in other novels, hold a major roles in the novel because of the three clashing voices. A lot of key information is hinted at by the footnotes; for example, the editor tries to clarify Johnny’s footnote “in an effort to limit confusion” and explain the reference to Dante within the text to the reader (Danielewiski, 4). Zampanó’s, Johnny’s, and the editor’s clashing voices all work together to help clarify otherwise non-existent or uncertain information. This essential clarity causes the footnotes to play a vital role in the distribution of information within the text. The vital information stored within the footnotes also alters the audience’s reading method by creating an abrupt or sudden stop in the flow of the story. The method Danielewiski lays out before the reader causes his audience to actively search the text for clues, rather than follow the natural flow of a narrative. Though Mary Shelley’s novel, Frankenstein, is regarded as a horror novel, it no longer carries the same scare factor due to contemporary horror film. Regardless her novel was considered to be downright terrifying during the time period of Frankenstein’s publication. Shelley spawned the idea for Frankenstein through a nightmare of hers, which closely resembled Frankenstein’s creation. At the time of Frankenstein’s publication galvanism was considered a new science, and to most people of society a horrifying and blasphemous idea. Mary Shelley aids the frightening idea of the book through her elusive and vague use of galvanism. Shelley never fully states in Frankenstein, the creature was brought to life through the uses of galvanism, but leaves many subtle hints throughout the book. This allows readers to assume galvanism was the reason behind the creatures newly given life. Shelley leaves this key piece of information out of the book, because the idea of galvanism was only about thirty years old at the time of Frankenstein’s publication, and many people of that time period were not informed on the specifics of galvanism. The idea of using electricity to reanimate parts of a dead human body, instilled blood curdling fear and disgust among the public, which Shelley capitalizes on in her book. During the creature’s reanimation scene in the novel, Frankenstein states that he will, “infuses a spark of being into the lifeless thing” (Shelley 58). Shelley does not forwardly tell the reader the creature is being brought to life through the use of galvanism, because most of the public during the early nineteenth century are unaware of galvanism, which gives the scene a distinctive mysterious effect. The mysterious effect allowed readers of that time period to think of the most horrifying way to spark a being alive. Although the current generation is accustom to the idea of the spark being a bolt of lightning, as it is depicted in many Hollywood versions of Frankenstein, the public during the time of the publication did not have major motion pictures to persuade their imagination into thinking of a lightning bolt. To nudge the readers in the right direction Shelley leaves hint at the beginning of Frankenstein’s travels, when he encounters “a stream of fire issue from an old and beautiful oak” (42). After the stream of fire leaves the tree, Frankenstein is baffled when he sees a stump in place of the tree. After inquiring about electricity laws, his acquaintance “formed on the subject of electricity and galvanism, which were new and astonishing to [him]” (43). This allows the reader to make the direct connection that the spark associated to the creatures new life is a by-produce of the new science, galvanism, which intrigued Frankenstein. Mary Shelley does not go into detail on the subject of galvanism in the beginning to the book, this leaves galvanism open to the readers interpretation. When she does this, the idea of galvanism can go from small electrical impulses to trigger key muscle reactions, to the more imaginative idea that the lightning bolt can cause a hideous very much dead jigsaw-puzzled like creature can be brought to life. The open ended idea of galvanism can elevate the fear factor for readers depending on their imagination level, since Mary Shelley left no defined ideas. For example Mary Shelley’s nightmare, which envisioned Frankenstein’s experiment, was quite imaginative for her time period and even for those scientist who experimented on galvanism. Before the publication of Frankenstein, only small experiments on galvanism had been done to excite muscles, no one though it could be used to reanimate a deceased human. It was not until the year of Frankenstein’s publication, a full body was experimented on. Even then the scientist, Andrew Ure, still did not reanimate the body, although he was hopeful at the end of the experiment that reanimation could happen. The experiments were said to be so frightening to the public that many who were present during the public experiments had to leave the ghastly sight. With such strong reactions to simple muscle stimulation, one can only imagine how frightening the idea bring someone back to life would be. Nevertheless, the fact that Shelley left the idea of galvanism as an instrument of life open to interpretation, would be an effective way for her to instill terror into her readers. Since the public reacted so harshly towards the experiments, the scientist were considered to be deranged in the head. Mary Shelley also uses how the public reacted to the experiments, in a similar way throughout the book. Frankenstein states constantly in the book, that if he would come clean about his creation, his testimony “would have been considered the ravings of a madman” (82). This allows the author to one up the fear factor of the novel, by persuading the readers to consider Frankenstein as a madman. Though Mary Shelley’s vague and elusive idea of galvanism, the reader is allowed to overly imagine an already frightening topic of the time period. Thus causing Frankenstein to be a truly terrifying novel of that time period. In Emily Carroll’s His Face All Red, the reader is left open to interpretation of the ending. To decide whether the main character’s brother is dead or not, and if he is the beast. Many small details of the comic can allow readers to propose the theory that the brother is in fact not dead. 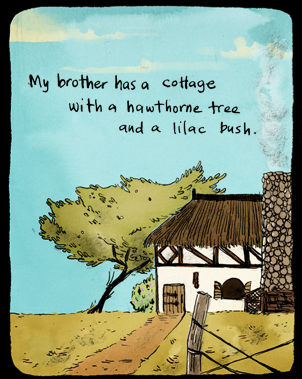 The first piece of evidence readers encounter, is when the main character is describing his brother’s house. Which is said to have a lilac bush outside of the house, later in the comic the main character says the mysterious hole in the woods also smells of lilac. This clue many not seem important but after the brother revisits the same hole, he finds a man who looks similar to his brother, resting within. As readers have not been made aware of the sleeping arrangements within the brother’s house at the beginning narration of the comic, thus we do not know if the brother has been sleeping in the house or has been sleeping in the hole. The lilac smell coming from within the hole, can cause the reader to assume that the brother sleeps within the hole, and is in fact the beast. The Reader gain the final piece of evidence when the main character is shown dragging his “dead” brother towards the hole within the woods. The face of the brother is shown with his eyes still open. The same faces is shown when the main character finds the brother within the hole, after the main character “killed” him. The illustration of the brother with his eyes open after “death”, allows a reader to assume the brother is still alive as most illustrations of people who are presumed to be dead are drawn with their eyes closed. 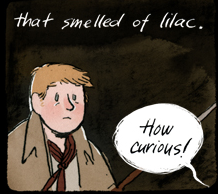 Emily Carroll seems to have ended the comic with many questions unanswered, but the subtle use of clues within her illustration, and the way she uses narration to describe little details, allows the reader to come to a conclusion of the brothers fate.